Arrrrrrrrr! That’s yer nine-letter arrr meanin’ Planksy, yer favorite pirate turkey, is back in town with yer holiday greetings and grog as me gobbler mesmerizes ye into a swirl of hornpipe dances and mirthy songs. Is it a beaut of a mirage? Nay, it’s me myself, with 300 fowl strong, sailing up I-35 in me pirate vessel filled with gifts galore, and me mateys, me special pirate’s brew, eggnog rum (that’s with yer soy substitute for yer milk and eggs), strong with me Jolly Roger, barrel upon barrel, not for land lubbers, nay, but for pirate turkeys in person and at heart. So, prithee, me dear Planksy lovers, what does yer pirate turkey have in mind this Christmas? Nothing else but ye annual dranks and planks. If ye done well, buccaneers, ye get me dranks straight from the barrel with hornpipe accompaniment and general merriment lasting to the wee hours. And it’s all on board, if ye get me drift? If yer a lubber of the land variety, me admitted gobbler worshippers, ye get me planks, right off the boat where ye can make friendsies with the toothy fishes. Planks.Tis nothin’ new, but me first planks go to U.S. Sen. Jim Inhofe, the lubber who claimed he’d personally ended all talk of global warming in the entire world forever and more. But ye listen, me bird lovers. Inhofe is filled with swarmy talk, aye, and so I declare the lubber a story teller, and he always ends it well for the oil companies, don’t he, mateys? Ahoy, listen to the squeals of bilge rats at yer own risk, me mateys. Dranks. Methinks me dranks galore go to none other than Ed Shadid, the Oklahoma City Councilman, who got discrimination protection for city’s workers who happen to be in the LGBT flock. A toast to ye, sir: “Here’s to Ed Shadid, the sea dog that does hunt, yer doing the job of a buccaneer, and may ye continue yer efforts to make this a better place for all.” Aye, true, there were others who helped make it happen, but Ed pushed it through. Come on board, Ed, and drink my special brew, reserved for swashbucklers like yerself. Let the pipes play, the dancers dance. Planks. Here’s me planks for two land lubbers, Gov. Mary Fallin and Insurance Commissioner John Doak, who did a little swarmy rule changing to get treasure for the rich insurance companies. Here’s the rub: Birth is no longer what the lubbers call a “qualifying event” for health insurance, which means the lubberish companies don’t have to cover sick babies because, now get this one, me mateys, these baby buccaneers are actually sick and that would cost money. Here’s another rub: Mary’s people say she committed this act of land lubbery to get coverage for more children, but, me sea dogs, it’s about treasure for insurance companies, not an act of kindness for families without sick babies. Arrr! So it’s planks for the both of them, and for our health care system in general. Ahoy, what do I see there, is it land, is it single payer, me mateys, single payer? Aye. I see it clearly through me gold pirate telescope. Dranks. Arrr! From his beak drips pearls of wisdom, and his gobbler reigns supreme in the western and eastern seas. He’s always in a fowl mood, if ye get me drift, and his crew stands as sturdy as beacons in stormy waters. 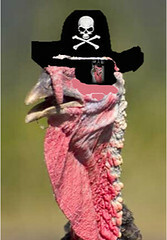 Here’s some dranks or thirty to myself, a pirate turkey for one and all this Christmas season. Have yerself a Jolly Roger holiday season, me mateys. Don’t spare the cheer. Save some tofurkey for yers truly. Ye never know when this bird will show up. Arrr!